New Apple iPhone Xs, Xs Max, XR and X, HTC U12+, Samsung Galaxy S9, S9+ and Note 9, Motorola z3, G and E, LG G7 and V40, Google Pixel 3 and Pixel 3XL, Sony Xperia XZ3, Amazon Fire Phone, Blackberry Key 2 and all Microsoft Lumia supported via Bluetooth. CLICK HERE FOR A PARTIAL LIST OF BLUETOOTH SUPPORTED CELL PHONES! CLICK HERE FOR A COMPLETE LIST OF OLDER CABLE SUPPORTED CELL PHONES! The revolutionary Dock-N-Talk™ allows you to dock your cell phone and talk using your normal corded or cordless phones to make and receive your cell phone calls. 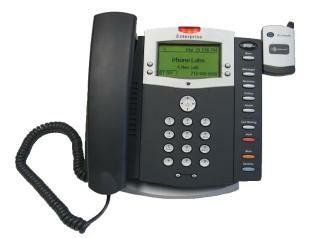 Create home phone service from your cell phone without the need for a land line or VOIP service. Now available in more than 70 countries around the world! The world's first and only universal cell phone docking station and charger now supports over 3000 cell phone models including ALL Bluetooth capable cell phones! Make your Cell Phone Service Become your Home Phone Service! "Cut the Cord" and Save $500 to $1,000 per Year! Get Perfect Cell Phone Indoor Coverage! Keep your Cell Phone Charging while using Home Phones! Use your Answering Machine to Screen your Cell Calls! Enjoy Better Sound Quality and Comfort by using your Home Phones! Protect your Expensive Smart Phone from Damage by using Home Phones! 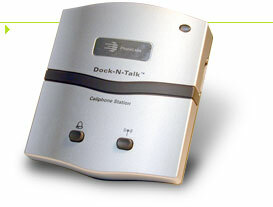 The patented Dock-N-Talk™ effectively turns your wireless service into "wired" service while it is docked. The Dock-N-Talk™ can be used in your home, office, dorm room, weekend home, boat, RV or any other location where cell service is available. 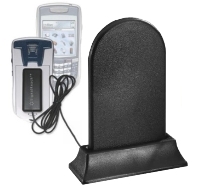 For remote or weak signal locations, your cell phone can be attached to external antennas or signal boosters and connected to the Dock-N-Talk™ for perfect cell service.